If James Cameron had left the movie industry or been alien-abducted (the fellow is some kind of genius, but, unfortunately, not smart enough to leave the movie industry) after making THE ABYSS, the 1989 underwater super-epic would have gone on to to be lumped in with WATERWORLD as an over-budget, over-reaching fantasy. Not without its virtues, but likely not worth all the fuss. But Cameron followed THE ABYSS with a string of blockbusters-to-end-all-blockbusters (TERMINATOR 2, TRUE LIES, TITANIC, AVATAR) plus some documentary films that returned him to the ocean-depths settings of THE ABYSS, just to show he was really serious about the marine milieu. The legacy has only uplifted the reputation of THE ABYSS. Upon its release it was "nice try but disappointing." Now it's in the category of "nice try but disappointing but HOLY F*! @#ING S#$%T JAMES CAMERON IS THE COOLEST MAN ALIVE!" 20th-Century Fox's huge-scale underwater epic was so highly touted in its production phase that rival Hollywood studios had time to get lookalike (and inferior) nautical sci-fi flicks (DEEP STAR SIX and LEVIATHAN, if you really had to ask) already in theaters by the time perfectionist director Cameron finished filming THE ABYSS in one of the largest underwater tanks ever constructed. Even then, Cameron was less than satisfied with the results, and put out "special editions." I honestly cannot say which version is showing in revival this weekend. 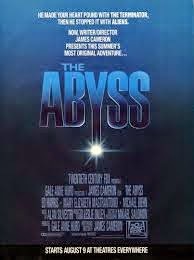 But any opportunity to watch THE ABYSS on a great big screen is worth it. Just don't say you weren't warned about the plotline. In the opening an American nuclear submarine bristling with atomic warheads encounters the deep-sea equivalent of a UFO and loses all power and contact with the outside world. As Cold-War tensions with the Soviet Union escalate over the incident, the US Navy conscripts the civilian oil-rig workers of a revolutionary underwater deep-sea drilling platform to mount a rescue expedition (it turns out to be more sinister than that) to the unresponsive sub. Complications ensue, as a hurricane whips up the ocean surface. Moreover, the platform was a joint collaboration of a maverick scientist-engineer (Ed Harris) and his badly estranged wife (Mary Elizabeth Mastrantonio), who have to uncomfortably reunite to lead the team. Amidst the marital storms, the platform is itself battered and crippled in a freak accident. The commanding Navy SEAL officer (Michael Biehn) in charge of the military-ops end starts going dangerously insane under the pressure - even more so when the luminous, enigmatic, inquisitive UFO aliens return to check out the stressed humans up close. The trouble with THE ABYSS is its strengths, paradoxically. This suspenseful material would have worked just dandy as a deep-sea action-adventure (much as that would have put it into the "disaster-movie" genre). Cameron's conjuring up of these folks trapped in their various vehicles and stations in a sunless underwater environment - as replete with wonder and potentially deadly as deep space - with the clock ticking away and deadly pressure, literally, increasing, is gripping enough on its own terms. Intrusion of amphibious UFOnauts into all this, actors Harris and Mastrantonio gaping at the CGI f/x in open-mouth Spielbergian Good Vibes wonder, just seems unnecessary. Actually rather juvenile. Much as Cameron uses the E.T.s (who look remarkably like angels, wink-wink, nudge-nudge) as a key element to get across a payoff ending of worldwide disarmament and DAY THE EARTH STOOD STILL-style peace enforced by superior space beings. Which does sound rather juvenile, let's face it. Call the whole alien portion of THE ABYSS a Close Encounter of the Rather Unnecessary Kind, even with all the orchestral crescendos and awesome visuals. But, since the creation of THE ABYSS movie fans learned to tolerate the likes of Jar Jar Binks, so take the good with the bad. At least we all got off easy compared to the likes of actor Ed Harris. His ordeal shooting THE ABYSS, scuba-thesping to Cameron's specifications, was so grueling he supposedly stated he would never work with James Cameron again, ever (I've never worked with James Cameron in the first place, so imagine how bad my life has been).